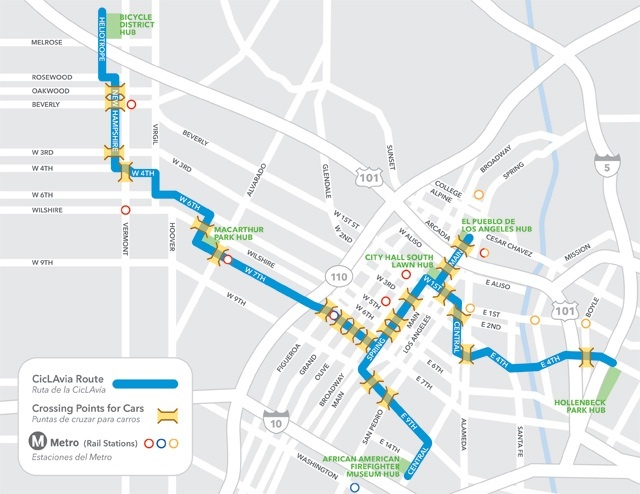 CicLAvia returns to the streets of Los Angeles on October 9th, and the organization has made just a few slight changes to their expanded route map. When it comes to the route, this time around they kept the same 7.5-mile route from the last two events, but added offshoots into Chinatown and the Fashion District. The Chinatown route had to be modified slightly after it was initially announced, points out Streesblog, who note that the "slight trimming" stemmed from a need to make room for the Chinese Consolidated Benevolent Association&apos;s celebration of the 100th anniversary of the founding of Taiwan. Now the route terminus is at El Pueblo near Olvera Street, but there will be extra bike parking available for participants who want to check out the celebration&apos;s parade. CicLAvia is a concept that originated in Bogotá, Colombia over three decades ago. "CicLAvia makes the streets safe for people to walk, skate, play and ride a bike. There are activities along the route. Shop owners and restaurants are encouraged to open their doors to people along the CicLAvia," explain organizers of the LA event. The idea is to give people a break from driving, and a way to engage with the community on the streets without car traffic. "It creates a network of connections between our neighborhoods and businesses and parks with corridors filled with fun," they explain. The inaugural CicLAvia was deemed successful, and a second event followed in April. The weekend overall is going to be a boon for bicyclists, with the Tour de Fat taking place the day before, bringing together bikes and beer. Check out all of our coverage of CicLAvia. You can also "like" CicLAvia on Facebook and follow them on Twitter.